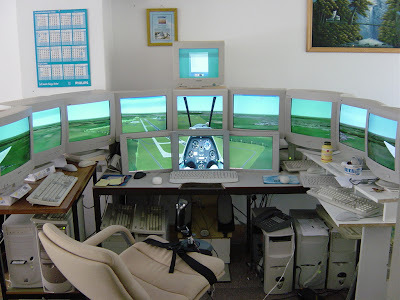 This is probably the best flight simulation and experience that you can get from the comfort your home. With a full panoramic view and strapped into a so called cockpit with the controller in between your thighs, you are ready to rock and roll. Ha ha. Cool! It would be even better with some newer flat screen monitors, but those old monitors are cheap and would cut down the cost for sure.